Gweakles is the Youtube channel name of Kiki a talented painter which paints watercolors and other mediums and shares the process with thousands of her followers! You can click here and see Gweakles channel, if you like art, speed paintings and fresh videos, you should subscribe to her channel and get new ideas and techniques to learn from. Kiki was kind enough to accept our offer to try out our new set of professional grade watercolor brushes and share her thoughts with her followers. You can see in the video, the unboxing of the Rigger Art brushes, and how she evaluates them one by one, and then later on use the brushes to paint John Wick in speedpaint. It is wonderful to see brushes come to life, and used with great talent dipped in watercolors and bring images into art. After Kiki reviews the brushes she checks Rigger Art brush holder roll up too, the brush rollup case was sent with a large gift pouch, to help artists carry art supplies nice and clean. There is a Giveaway for Gweakles followers! 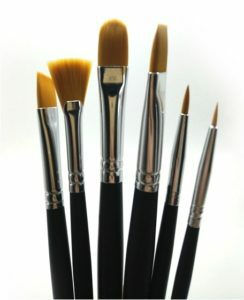 To win a brush set or a brush holder – like our FB page and add your comment on the post HERE. There will be two winners!! This entry was posted in Paintbrush Holder, Painting Brushes, Videos and tagged Brush Organizer, Paintbrush Holder Case, Rigger Art Brushes, Short Handle Paintbrushes, watercolor brushes by RiggerArts. Bookmark the permalink.